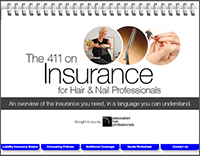 An overview of the insurance cosmetologists and hairstylists need, in a language you can understand. Have you ever asked yourself, "Do hairstylists really need liability insurance?" Or, "What does cosmetologist insurance do anyway?" Good news! We've got your answers in this easy-to-understand ebook that translates complicated liability insurance concepts into language that makes sense in your life behind the chair. This ebook will help you make sure you've got the knowledge to find liability insurance created with the needs of hairstylists in mind. Fill out the form below to download your free copy!